This Strawberry Pie has fresh strawberries mounded high in a rich, buttery crust. A little (or big) slice of delicious. 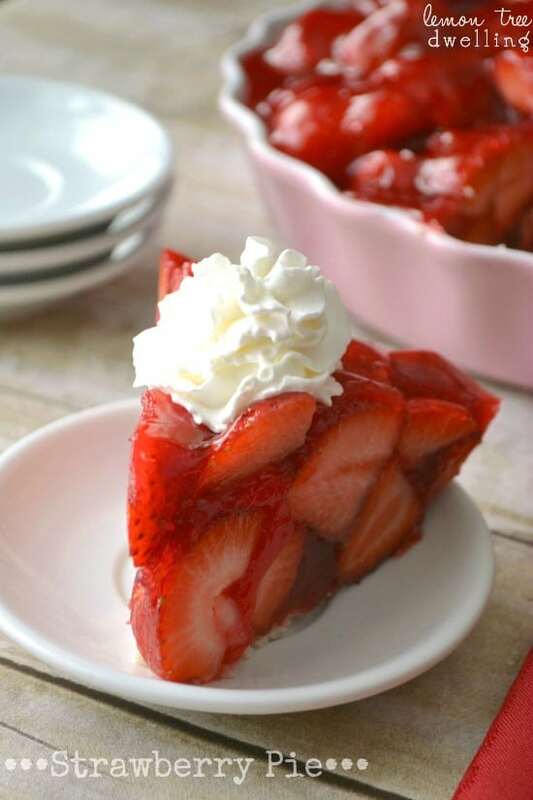 The perfect summer dessert and my favorite strawberry pie! Every summer, since Ellia turned one, we have had a big birthday bash to celebrate our kids! First it was just for Ellia, then for Ellia & Greta, and for the past two years it’s been for all three girls. We’ve had seven different themes, ranging from polka dots to zoo animals to butterflies to bumblebees to princesses to a backyard picnic and, most recently, a Red, White & Blue Garden Party. If we decide to do it again this year, it will be our eighth year in a row…..and…..we will have a brand new baby! The cons? Well….the stress of planning a party! Even though I love to do it, the truth is, it’s stressful. Not to mention the time it takes to get ready for it, the cost, and the amount of new STUFF that comes into our house…. I am really torn. On the one hand, I can’t imagine thinking it’s a good idea. And on the other hand, I can’t imagine not having a summer birthday bash. That means Nora only got two parties, instead of the 7 that Ellia got? I’ll never hear the end of it! Aggghhhh!!! Am I overthinking it?? Maybe I need to focus on something simpler…like all the delicious food I get to eat when we have a party! I am lucky to have awesome friends and family who bring things to help out….like appetizers and salads and, of course, DESSERTS! This strawberry pie recipe is my mom’s signature dessert. She has been making it since we were kids, and it’s probably the most requested dessert at any family function! We love it! Looking at it, you can see why (am I right?) 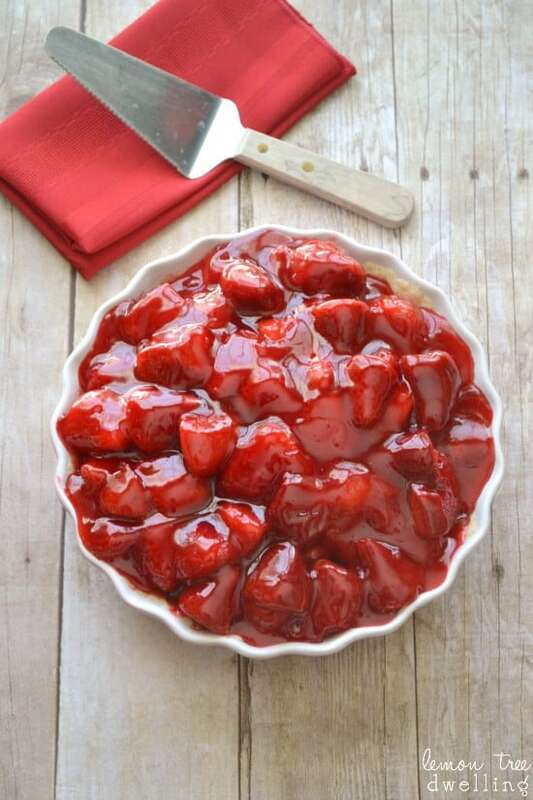 It’s packed to the brim with fresh, whole strawberries and a thick, gooey glaze. But what really makes the pie is the crust. 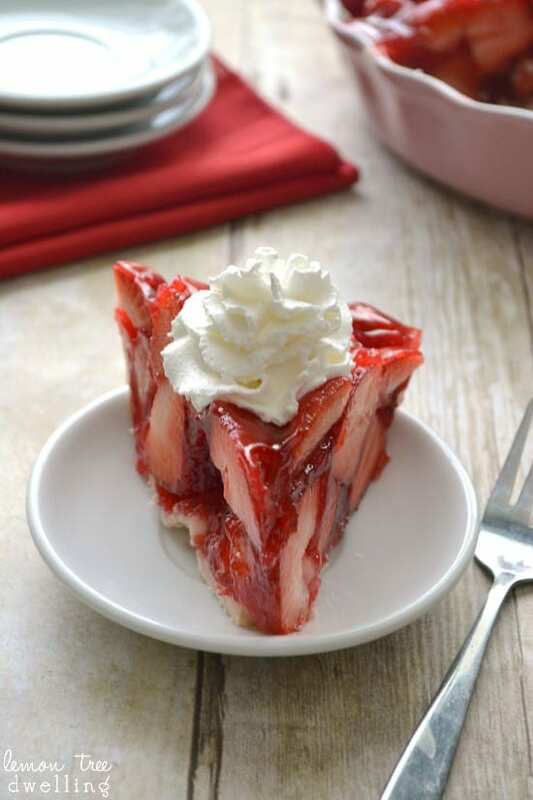 I can’t believe I’m saying that, because I’m usually not a crust person…..but the crust on this strawberry pie is my favorite! It’s so rich and buttery….almost like shortbread….and so easy to make. Without it, the pie just wouldn’t be the same! So I guess what I’m saying is maybe there will be a party, after all. We need to celebrate our kids’ 8th, 6th, and 3rd birthdays….and at that point, there may still be some people who haven’t even met the baby. Why not celebrate with the people we love?? And……with the strawberry pie we love?? The BEST Strawberry Pie! Fresh strawberries mounded high in a rich, buttery crust. A little (or big) slice of delicious....perfect for summer! *If you are using a shallow pie plate cut filling recipe in half. Mix butter, sugar, and flour and press into a greased deep pie plate. Bake at 375 degrees for 10-15, until lightly browned. 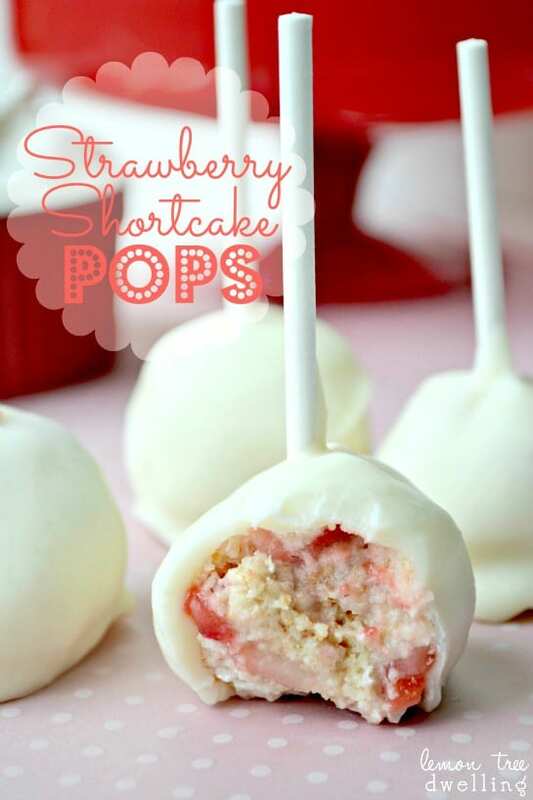 My blogging friends make amazing strawberry recipes, too! I have no doubt whatever you do will be amazing! 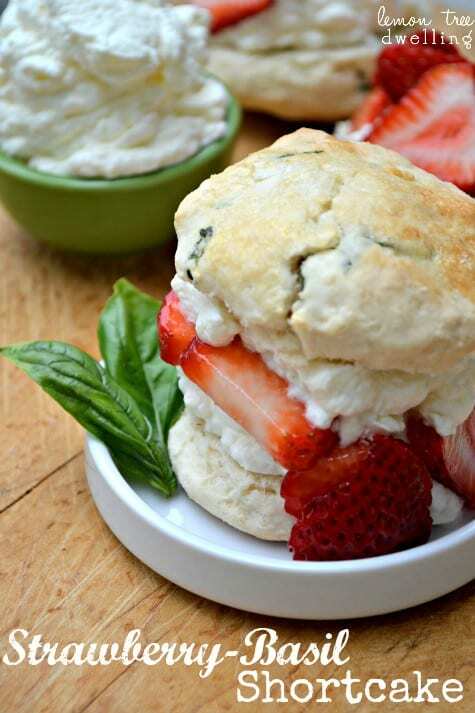 I can’t wait to try this recipe after strawberry picking this Summer! Thanks, Jess! It is definitely best with fresh, hand picked strawberries! I need to make strawberry picking happen this summer!! Hi Betty, I used plain. Hope this helps! I am going to try this for Easter. I am going to make it gluten free. I’ll let you know how it comes out. What does c mean please in recipe. i MADE THIS FOR MY GRANDDAUGHTER BEGGING ME TOO, SHE IS 22, IT WAS VERY GOOD BUT SEEMED TO THICK, I USED THE ABOUT OF CORN STARCH IT CALLED FOR BUT WAS REALLY TOO THICK, WHAT DID I DO WRONG, COOK TOO LONG/ LESS CORN STARCH??? Hi Donna, here are a few things to check: Did you measure the cornstarch carefully to make sure you didn’t add more than 6 level Tbsp? Once you brought the cornstarch mixture to a boil, did you remove it from the heat? I’m so sorry it ended up too thick for you! Did yo use a deep dish pie plate as called for? The same thing happened to me. The filling had a rubbery texture. I will try a different filling next time, but I’m keeping the crust, it was fabulous! I have a recipe similar to this one that calls for 1.5 cups sugar, 1.5 cups water, 1/4 cup cornstarch and a smaller 3 oz. strawberry Jello. When measuring out dry ingredients make sure you are using dry measure not liquid measure cups and make sure the measure is level. Have to say, I don’t measure out the strawberries, just use enough to fill the pie plate and get coated with the glaze. I just use a Pillsbury pie crust baked as directed, but will definitely try this recipe crust. You say 3 quarts strawberry D. How much is that in ounces? 1 lb. is 16 ounces so 1 quart would be about 24 oz. or 680grams. The recipe says 3 lbs. ( that’s pounds) read your recipe carefully. I tried your recipe today instead of my go to Joy of. cooking recipe. When I looked at it I thought it was a lot of sugar plus the jello. I cut down the sugar to 1.5 cups and still it was way too sweet. Had to add juice of a lemon but still sweet. Sorry, but will go back to the tried and true Joy of Cooking. Except her recipe calls for 3 Tbls. Not 3 cups. Actually, as I read it…….the filling has 3c and the crust 3 Tbls. Agree 3c of sugar in the filling is far too much……. is this an error ? The recipe says 3 Tbsp. sugar in the crust and 2 cups of sugar in the filling. The filling has 2 cups of sugar. maybe sub splenda instead of sugar, sugar free jello and lite coolwhip 0r whipped cream. I’ve had it this way an it’s delicious. At that point, what’s the point? This is a dessert. It’s not a protein bar or a health food. It’s about pleasure. Actually it calls for 2 cups in the filling and 3 tablespoons in the crust. It is a good recipe. I have Celiac disease, could I use gluten free flour? It calls for 3T in crust. But does call for 2 cups in filling. Does sound like a bit much in the filling. Try the recipe first and then decide. Also, when you change the quantity of sugar, you need to change the water quantity as well. you may end up with less glaze for the berries. What kind of flour do you use?? Self rising or All-Purpose? Sounds and looks wonderful but way too much sugar 2 cups!!!!!!! If you do have a party, do you want me to bring the pie? I’ll even make one for you if you decide not to have a party. Great pictures as always. I LOVE THIS PIE!!!!!!! My Mother always put a layer of softened cream cheese on the cooled crust….same recipe otherwise…. except she used a box of wild strawberry jello. Best strawberry pie ever! Exactly right a out the wild strawberry jello–if you can still find it. If not, you can add Citrix acid which makes it taste like wild strawberry! I don’t remember exactly how much, but those of you who have never tried it, would be amazed how much better it is than regular strawberry. Somebody mentioned cream cheese filling in pre-baked crust before adding strawberry filling. Instead, mix cream cheese and vanilla instant pudding (already prepared) till well blended. Add sliced bananas (not too ripe) and put as first layer on baked crust. Pour strawberry filling on top, and then too with whipped cream and a few strawberry halves for appearance. I used to serve this at my restaurant. It was a favorite out of the thirty varieties that I served. I’ve always thought that strawberry pie was one of the prettiest pies, and yours is no exception! Thanks so much, Erin! I totally agree….strawberries are gorgeous! If you don’t have the party, will Betty make ME a pie, too? Seriously, I love you, your family, your parties and all of the food….but, your mom’s pie is TO. DIE. FOR. I dream about that pie. Ha! I’m sure she would….she’s a sucker for flattery 😉 But you know me. There will be a party! This is GORGEOUS! I can’t wait for summer and I will have to try this soon! I totally agree, Laura! Can’t WAIT for summer and all the delicious fruits and veggies!! What a beautiful-looking pie! Can’t wait for summer in NY so I can get in on this strawberry goodness! What a beautiful pie! I’m craving it, along with the warmer weather!! Thanks, Ang! I TOTALLY hear you! I just bought strawberries over the weekend and made triple berry jam. Love it when strawberry season approaches! All your strawberry recipes looks amazing! Triple Berry Jam sounds delicious, Brooke! Thanks so much for your sweet comment….I am a strawberry lover and can’t wait till they are in season! Oh my goodness. This screams summer. I want summer so now I want this Strawberry Pie! Go simple on the party 🙂 They won’t care! It’s still a party! I LOVE your thinking, Julie! You’re so right!! When Nora was a newborn we went super simple and had a lovely princess party without going overboard. I totally need to keep it low key! I love how piled high those strawberries are! Cathy, your photos are gorgeous! Thanks, Tanya! My mom always piles them HIGH….and I wanted mine to be the same. Before I knew it I was at 3 quarts and wasn’t looking back! That looks so refreshing and it makes me long for summer! This is THE summer pie for me, Tonia….so I totally hear you! Ooh, this makes me so excited for strawberry season! Thanks for the recipe! Thanks, Jenny! ME TOO!! I’m really hoping to pick our own this year….they are so much better fresh from the vine! Please clear up the sugar thing. Is it two cups for the filling? I am definitely going to try this when I get my hands on some fresh strawberries. Thanks for sharing!!!! I followed the recipe, with one exception. For the Filing, I used 1 1/2 cups of sugar, and then 1/2 cup of a sugar substitute. The pie was great. One of my guest said best strawberry pie. I loved the crust. 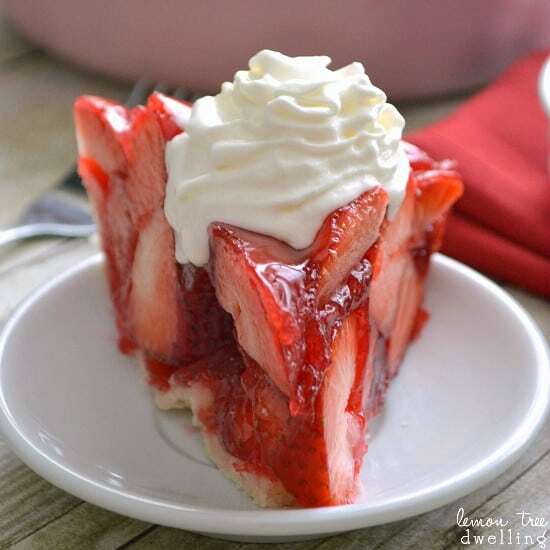 This is very similar to a strawberry pie recipe that I have been making for years! The glaze is so much better than that store bought stuff! My recipe however only calls for 1 cup of sugar and i’ve even cut it down to 3/4’s and it’s still plenty sweet! You say strawberry and I’m there! Thank you so much for these gorgeous recipe’s!! This looks fantastic, Cathy! I grew up with fresh strawberry pie every summer but have never made it. Yum! Strawberries are plentiful here in sw florida….made the pie today, it looks amazing and can’t wait to serve it this evening for desert with the family! I would to make it, but I want to know if you put 2 cups of sugar in your filling. This is not too sweet with the jell-o. I did use 2 c. of sugar and did not find it excessively sweet, but you could definitely use less! Because I used such a deep pie plate, I ended up using 3 quarts of strawberries and doubling the amount of filling I would normally use. With fewer strawberries, you need less filling, which automatically would be less sugar. BUT….feel free to cut back on the sugar either way if you would like to. Hope this helps! Do you have a sugar free version with Splenda? You answered the question I had. Looking forward to trying this when season arrives. wow. you could use blueberries or raspberries or blackberries in that pie if you wanted to. Just change the fruit and change the flavor of the jello. You could even pour in a layer of custard first then add the glazed fruit on top of it. I’m so excited to make this! How far in advance do you usually make it? I don’t want the crust to get soggy but it’s nice to be prepped early if possible. I tried this for mother’s day and it was delicious! Everyone loved it. I was afraid it would be too sweet or artificial tasting due to the strawberry jello, but it was fantastic. And so beautiful, too! A real showstopper. I added some grated lemon zest to the crust and it was a nice touch too. Thanks for a great recipe that will definitely be part of my permanent collection! I am new to pinterest. I was just browsing when I saw your pie I will be trying this weekend. I just made this pie, next time I will scoop the berry filling mixture into my pie pan, I had filling over flowing EVERYWHERE!! Lucky I had done it over a towel and had lots of helping fingers to scoop it up (and eat it). I love this recipe SO much! The crust also a major hit. I made the strawberry in the spring and last week wanted to make it again but the strawberries were awful in the store so I substituted for raspberries. Wow… It was amazing. ThankYOU for sharing. I love to bake and cook and I must say this is my most perfect pie recipe ever! Love this pie! Made it today and can’t wait to make it for my friends. Next time I will use a bit less sugar as I did find it a touch too seet. The presentation is amazing! I have a question about jell-o. Is that a .6 oz package of jell-o mix or 6 oz of prepared jell-o? I am doing a review of this recipe (this is SO good!) and just wanted to get some clarification on something: when you say the recipe calls for 3 quarts, are you meaning 3 quarts (1.5 – 2.3 pounds each) or three 1-lb. containers? I used a deep pie dish and could barely fit 3 pounds in there, let alone fitting 4.5 – 6.9 pounds if I was to try and get 3 quarts in there. How long do u let the glaze cool before folding in strawberries? I love the Strawberry Pie. It turned out perfect and so easy to make for such a beautiful presentation. I’m making it again for the ladies at brunch on Wednesday. I’m doing an adult version of this pie by letting the strawberries sit with sugar for 2 hours and then collecting the juice and combining it with Rosé wine to about get about a cup and half of liquid and then taking a quarter cup of it and mixing it with a quarter cup of corn starch. I bring the remaining liquid to a boil and let it simmer a bit before adding the starch mixture. 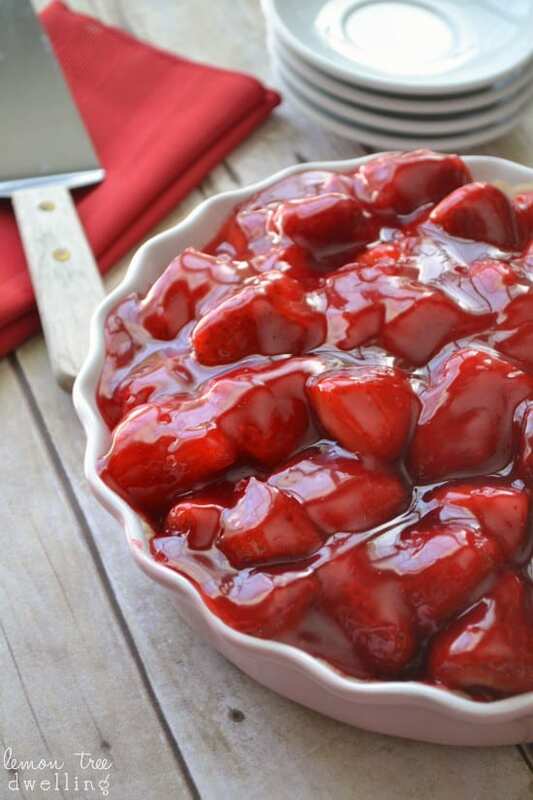 It makes an instant jelly that once cooled down and mixed with the strawberries makes for a killer pie filling. I found the recipe in an old LCBO magazine here in Canada a few years back. Add a touch a grounded white pepper and it’s heaven! I simply must chime in to say what a fine looking strawberry pie this baby is!! Such a beautiful pie! Pinned and sharing on FB! All I want is for it to be summer and to be sitting by the pool with a slice of this pie. Is that too much to ask for?! LOL. Beautiful pie dear! What a gorgeous slice of pie! It looks amazing! this pie is gorgeous!!! can’t wait to try it!!! This is the most beautiful strawberry pie I’ve ever seen! Whoa baby! This is gorgeous and looks so good! I read the reviews on the pie and cut back the sugar to 1/2 cup. It was still too sweet. The crust totally stuck to the pie plate. Didn’t care for it at all. Will not make again. This is the first one of your recipes that I’ve mad that I didn’t like. I’m very sorry to hear that, Amber! This pie is always a hit wherever it goes….I’m sorry that it wasn’t a hit for you! Two questions: Is it ok to substitute Almond flour or Domata Gluten Free Recipe Ready Flour? I am not sure if the almond flour is recipe ready. Also if I decrease the amount of sugar do I adjust any of the other ingredients? I’ve never used either of those flours, but I would imagine they would work just fine. If you’d like to decrease the sugar, there’s no need to adjust the other ingredients. Hope you enjoy! We tried this last year. It is indeed WONDERFUL!!! Now I have to try it with different sweeteners and crust because Himself has been diagnosed as a Type 2 diabetic. I have no doubt it will still be wonderful. I couldn’t find it anywhere on Pinterest, so I pinned it from here. I have a very similar recipe with 6 oz. cook & serve vanilla pudding mix instead of the sugar and cornstarch. To save a little time I use Ritz frozen pie crust. It is the best tasting of the frozen. Fresh strawberry pie instead of cooked is so juicy and quick. LOVE IT !!! Help! I have read all the comments and am now totally confused. Three quarts berries and TWO CUPS sugar for the filling? I plan to make this in May for an event. It looks absolutely delicious, and I want it to be perfect. Thanks! 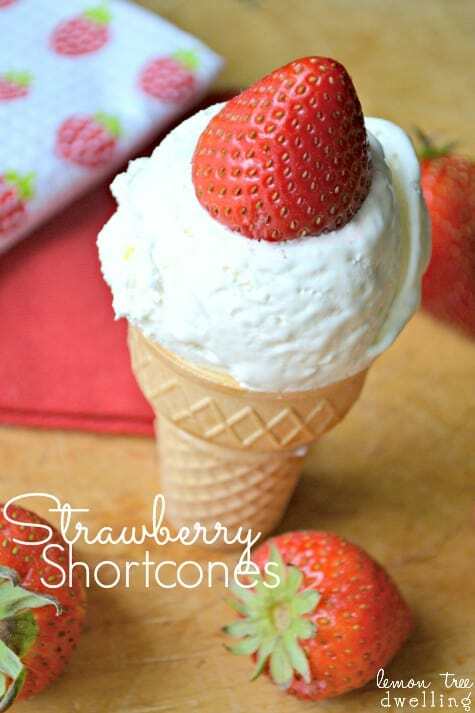 I will definitely be trying this out during strawberry season! Looks delish!! Tried the recipe today and it was a big hit with my husband. He said if he had three thumbs it would get it. He loves strawberries and Jello normally. For me it was too sweet. Also he doesn’t like crust and I do. Mine stuck to the pie plate and we didn’t have any. I will make it again in a deeper pie dish. I don’t know how to fix the crust. This pie looks great and I’m definitely trying it! I’m scared to make the crust though (I’m not much of a cook, and have never actually made a crust… Don’t laugh). Do you think it would be just as good if I used a store bought crust, and if so, what kind would you recommend? A graham cracker crust or the pre made crust that you roll out into a pie plate? Sorry if this is a stupid question. I’m really inexperienced in the kitchen, especially with baking. I love all of your recipes! Make her crust… it is half the yum! This is a “shortbread” crust and no frozen or store-bought will give you the buttery deliciousness… trust me… you can do this! And will love what you get to eat. This looks good, but i am a bit confused about the crust. It says press in a deep pie plate. Do I just press it on the bottom or up the sides also. I cannot tell by the picture. Here’s another idea for this recipe (i love playing with recipes)…instead of using 2c. water…try 2c. apple juice. I havent tried this yet BUT any time i make jello, instead of using hot and cold water, I use hot and cold apple juice. Making this pie now. Is the crust supposed to be really soft when it comes out of the oven? Hi. I have been making this pie for years! It was a recipe from a favorite aunt. No, the crust should not be soft out of the oven, but just lightly browned. And don’t expect to have a pretty fluted edge pie; the butter crust just won’t do that. But the combination of butter crust and the strawberry filling is to die for!! I have also used Splenda and sugar-free Strawberry Jello, and make it more diabetic friendly. do you make the jello with the regular water it calls forand then add to the filling mix or do you just put the jello in the filling with out dissoling it first in boiling water? Hi Mary, you don’t need to add the water to the jello….just add the jello mix right into the other ingredients. Hope this helps! Can I make this pie the day before? Reader Debbie Wolfe (March 5/16 wrote that she used Splenda as her husband is diabetic. Would anyone know just how much splenda as I sometimes find it very sweet, more so than sugar. I have never baked with splenda but would love to make this pie, It looks soooooo good. Can you use frozen strawberries or other frozen fruits? I have a lot of fruit I put up and am looking for different uses for them. Thank you in advance! i would like to know too if you can use frozen strawberries. Hi Mary, I believe the pie will be too watery with frozen strawberries. I’ve never tried it to know for sure, but it would definitely change the texture and I’m not sure the pie would set. Hope this helps! Hi Judy, I used a 10 inch pie pan. Thanks! If I wanted to use a 3 Quart deep pie dish what changes would I make to this recipe? This recipe looks so good. Thank you for sharing. I made this pie yesterday. I will have to agree with one of the previous replies……I was not impressed with the crust at all. Based on other comments that I read prior to making the pie, I reduced the amount of sugar in the filling to one cup. I wish I had used 1 1/2 to 2 cups as it was not quite sweet enough with just one cup. Other than the crust, however, the pie is delicious!! This was the first strawberry pie I had ever attempted and it turned out GREAT! I was using only a shallow pie plate, so I cut the filling ingredients in half, as the recipe recommended. I have to agree with others: the crust was not that special. I will probably use store-bought crust from now on; it never seems to come out right when I try to make crust from scratch anyway. I used over a quart of strawberries, de-stemmed and cut into quarters, and it was a good amount. I cut down the sugar a bit, and it tasted great. I let it set up in the fridge for about 7 hours and the presentation was wonderful (my pies usually fall apart when you cut them!). This was a great recipe that I am definitely going to make for pitch-ins and parties. Love it! Great to hear, Beth! So glad you enjoyed it! would this recipe work with blueberries or blackberries? You can use lemon jello with the blueberries. I made this filling and just dumped it in a premade pie crust. It turned out delicious!!!!!!!!!!!!!!!!!!!!!! Great time saver! Thanks, David! Thanks so much, Emily! Hope everyone enjoyed!! It was too thick . didn’t like that. Do you leave the strawberries whole or cut them? What size of pie dish did you use? I know you said deep dish pie pan but what were the dimensions? And how long does the whole pie usually take to set in the fridge? I’m going to attempt to make this in the morning for Easter tomorrow! Made this recipe for Strawberry Pie. I will definitely be making it again. My guest’s words were its a “Keeper” recipe. My sister saw the sauce as I poured it over the strawberries and thought it was too runny. I told her it would set up in the fridge because it had the jello in it. Before she left (a couple hours later), I cut into it and it sliced beautifully. She couldn’t wait to take some home. Cathy I can hardly wait to try this recipe. 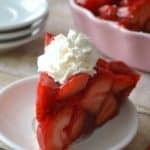 My husband absolutely loves strawberry pie, but I have never made it as I could not find a recipe that made it simple to do. I will definitely let you know how I made out. Hi – lovely dessert! Our neighbor made a “cookie pie crust” which is the same as yours except she used powdered sugar instead of regular sugar and added 1/4 c. of pecans. SO good. And she made a similar strawberry filling, except used half the quantity per pie and used 2 T. less corn starch. (Her recipe also called for wild strawberry jello, but I don’t think they make that anymore). I’ve been making strawberry pie for years and never use jello. To my pre-made pie shell, I place about 1 quart of whole strawberries (choose the nicest and most uniform ones-no huge ones) I cut up about a pint of strawberrries (exact amount not necessary. I just use whatever is leftover from the packages of strawberries) and put them in a saucepan. Then add 1 cup sugar and a pinch of salt. Mix 3T cornstarch and 1/4 cup water and add to the cut-up strawberries. Cook slowly until the sauce is clear. Allow it to cool and then pour over the berries in the pie plate. I sometimes add blueberries between the whole straberries. Thanks for this alternative. I don’t want to use Jello, so I hoped this recipe didn’t have it. Watching the video, I was smiling when I saw the sugar, water, and cornstarch being cooked for a glaze, because I make a similar glaze with crushed strawberries (or crushed blueberrries). I blanched when I saw the Jello being poured in. 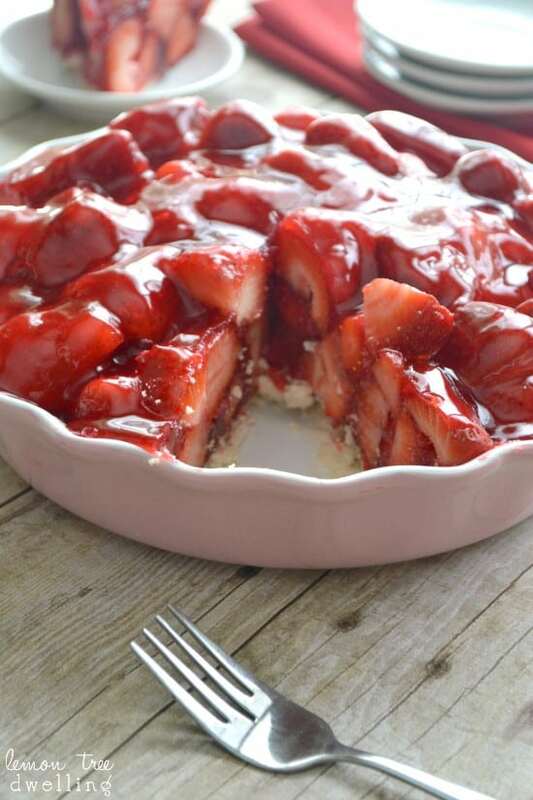 I thought this simple gorgeous pie could be made using my crushed strawberry glaze instead of the Jello, with its artificial flavors and colors. I thought of maybe adding gelatin. But I’m happy to see yours works fine without the gelatin. I’m looking forward to trying the no-roll crust from the recipe, and i hope my pie turns out as gorgeous as the one in the picture. I made this pie today. Followed instructions exactly and it turned out perfect. Beautiful and delicious. My family loved it. instead of a crust can i layer the strawberries between broken up angel food cake? Hi Joanne, This sounds delicious, although I worry that the cake would become soggy from the strawberries and glaze. If you decide to try it, I’d love to know how it turns out. Thanks! This recipe was simple to make but I thought the artificial strawberry flavoring in the Jello overpowered the taste of the fresh berries. I will look for another to use as my favorite. Great іnfo. Lսсky me I ran acrоss your website by chance (stumbleupon). I have saved it fօr later! In our house it’s called grandma Kitch’s strawberry pie. My husband grew up with this exact same recipe. It is fabulous, and an old recipe as we are pushing 60 yr old now. I make it all the time. Never any left overs, lol. This looks amazing! 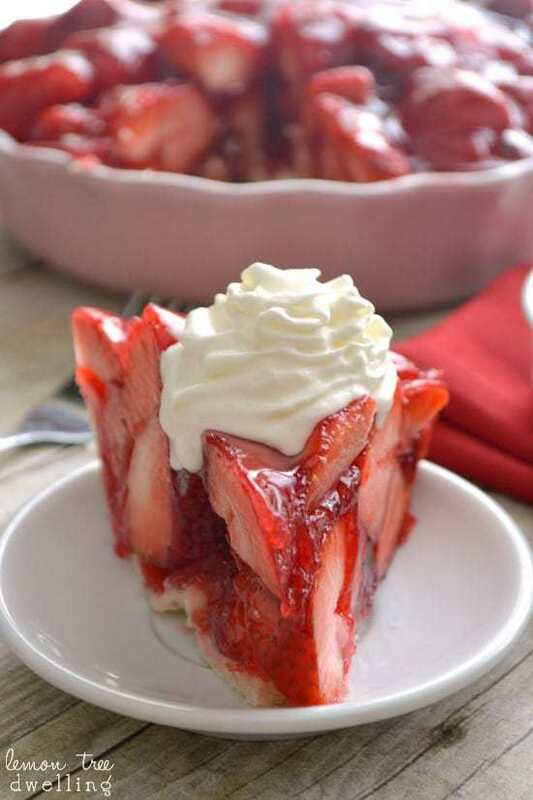 I love strawberry pie and can’t wait to make this! Quick question – do you recommend using salted or unsalted butter for the crust? This is a great recipe! The crust is perfect, I make mine in a deep dish corning casserole ( lasagne size 9×13) and I double the strawberry filling part, 3 cups of sugar instead of 4, add T of lemon juice. One pie just didn’t go far enough, so I use the casserole, fork pick the crust before baking, butter the dish before presting the mix into it. I will definitely try it. Our fresh picked strawberries are so sweet naturally I can’t see using more than 1/4 c of sugar. Especially using jello which is so sweet. Will watch the cornstarch. Will cutting down on sugar be a problem? Once the pie has set in the fridge, does it need to be kept refrigerated if being served the same day?? I prefer serving at room temperature, but wonder if the jello base will unset and get watery. The strawberry pie recipes looks great. How do I get the recipe? Mine did not set up. I have been eating more of a strawberry soup. Still tasty, nonetheless, but not ideal lol. Any idea what happened? What does the c represent in UK measurements please. I made this pie for years except I use 7up instead of water and cup of sugar….. Your pie looked everso pretty. I followed your recipe properly and it says to keep mixing the cornstarch until it goes thick and clear. Well I cooked it and cooked it and had to add more water in order to keep waiting for it to lose the misty look about it. It never went properly clear. I took it off the heat, then added a pack of Aeroplane Strawberry Jello and it went completely cloudy and a dull pink. It tasted wonderful but it was not particularly pretty at all. Can you give any advice please? I would like the pie to look as pretty as yours. Lulu- I did the same thing the first time although I didn’t cook it as long as you did. The trick is you take the filling off the heat the minute it goes into a boil. It really won’t go completely clear per say, there’s always a little misty. Once you take it off the heat it seems to get a bit clearer and once you add in the jello it looks how it should. Also I tried the New Pomegranate Blueberry Jello flavor. Super tasty with strawberries and blueberries. I made this using the new Pomegranate Blueberry Jello flavor and mixed in strawberries and blueberries and it was awesome! In fact I think I like the Pomegranate Blueberry flavor better than the regular strawberry flavor. I’ll use that from now on. If I only wanted to use 1cup sugar for the filling, how much water would you recommend so that I still have enough filling? I believe corn starch and cornflour are the same thing. finished off as per this recipe. Over night the bananas pick up some of the strawberry flavor. Coconut Cream was my favorite until I met her. My husband has 2 beautiful strawberry boxes, producing big, juicy strawberries, so when I seen this recipe I had to make it for him. The only thing I did different was cut the cornstarch (cornflour in Australia) to 4 tablespoons. It turned out fantastic, best strawberry pie ever. This was about 6 weeks ago……..now I’m making it again. Can sugar free jello be used? Have made the strawberry pie several times. A big hit with everyone. The only change I made was I substituted dairy free butter (Earths BalanceJ because of a dairy allergy. peaches/peach jello, raspberries/rasb jello, etc. For the strawberry pie, I like to use raspberry gelatin….like the deeper red with the strawberries. Now that peaches are in, I use the same recipe and use apricot gelatin. The apricot is a deeper color that the peach gelatin. Sometimes with both pie, add a few fresh blueberries to the top of the pie for garnish. How do I get just the receipe so that I can print it out?. I don’t want everything else, just the receipe. Your website is a nightmare! I’ve seen several of your recipes that I might like to print off and try but it takes an act of God sifting through pages of trash just to get all the pieces together. One might assume you intended it that way. When I see your recipes come up now, I don’t give them a second glance … I just move on. No website should be that cumbersome. To Randy – just had to respond to your msg. written 7/17/18. When I want to get a recipe found on-line, I copy and paste the part I want. I have a MAC and the Pages app works for me. When I copied this recipe into my Pages app, it picked up the “entire” article (which I didn’t copy), but I just edited with “cut” and created a new page then pasted the actual recipe onto a new “page”. The recipe I wanted came out perfectly. Maybe you have something similar on your computer. Hope this helps. This is delicious, and will make it, it is so easy. I made this with 2 lbs. strawberries, & 1 lb. rasberry. This is taste real good especially if you like rasberries. OMG, DEfinitely a keeper! We loved it! Only thing I did different, used sugar free jello and 1 1/2 c sugar so my husband would eat it. He loved it and said it was best dessert he’s ever had! Thank you so much! This was a great recipe. My crust stuck to the pan quite a bit, but we managed to get every last drop out. Any suggestions that might help this problem? I’m making this pie for Easter. I am going to grease and flour the pie pan before I put the crust in. Also I will not press the crust in firmly. I believe this will fix the sticking crust problem. Very excited to make this pie. I can’t wait to try this! If I remember right, the recipe did say to use a greased pie pan. Maybe some are not doing that? I agree with you. When I first made it I overlooked that detail. I just made it again and greased the pan thoroughly. No problems, pie popped right out.